Are you wanting to start your own home meditation practice? The number one piece of advice I have for you is: Just do it! Techniques are really useful for getting practice going, especially when we’re just starting out. 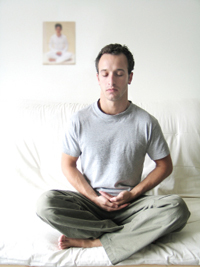 The first, and most widely used, is ‘Mindfulness of Breathing‘. There are literally hundreds, if not thousands of free guided breath meditations you can download. Everyone has their favorites. I would recommend visiting Gil Fronsdal’s site, audiodharma.org for a collection of practical, non airy-fairy guided breath meditations to help you get started. The site, dharmaseed.org also has hundreds of really good meditations. If you type ‘breath’ into the search bar, you’ll get all that they have to offer! Another one is what’s called ‘Body-Scanning‘. It’s basically a way of coming out of the head (where a lot of us may spend our day, working in an office and so forth), and into the direct felt sense of the body. You will find that there is an inherent quality of calm and relief that comes from this kind of meditation. Try it and see! The websites above will have many to offer as well, all for free. I would also add that the attitude you bring to the cushion will go a long in way in terms of getting meditation going in a way that feels natural and authentic for you. If there is an attitude of real interest – a real curiosity about what this mind of ours is, and particularly how it departs from the present moment, in favour of ideas of the past, future and parallel universes right now, then we’re less likely to kid ourselves. You could call this sincerity. It’s a kind of authenticity of intention, I reckon. A heartfelt desire – no – need to meditate. You may not have this particular hunger. Or maybe you have other ways of coming back into the stillness and silence of being. That’s all good too. But I’m kind of assuming that if you’ve read this far, you’ve felt the hunger. At least a little bit. Sometimes we only feel it when we’re really having a bad time, but then life gets OK again, and the hunger for a deeper peace goes away… But that’s another story. So that’s a few thoughts on beginning a meditation practice at home. Please drop me a line if there’s anything that’s not clear, or that I can elaborate upon. I am most happy to help! I am a housewife and mother, so can i start with meditation in night when everybody goes to sleep because for me that is the time for me ? Yes, yes and yes. If that’s your time, that’s the time to start a meditation practice. This is so inspiring. From today I start to do meditation everyday.